Alba Patera is a large shield volcano in the Tharsis region. 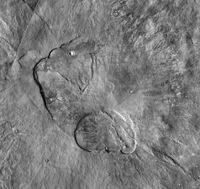 Its summit is low, only six kilometers above the surrounding terrain, but it covers an area greater than Olympus Mons. 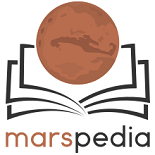 In terms of area, it is the largest volcano on Mars; indeed, it would cover a large part of the United States. Alba Mons is centered at 40.47N and 250.4E (109.6 W) in the Arcadia quadrangle. However, much of the volcano's western flank is located in the adjacent Diacria quadrangle. Exaggerated MOLA view of Alba Mons. Height has been multiplied by 10. The history of the name is a bit complex. "Alba" is a word meaning white, in reference to the white clouds that frequently appear in the region. At first the name was Alba Patera, where Patera is Latin for a saucer. 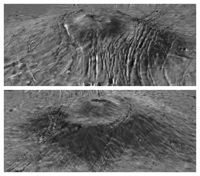 In 2007, the International Astronomical Union (IAU) renamed the volcano Alba Mons (Alba Mountain), reserving the term Alba Patera for the volcano's two central depressions (calderas). Nevertheless, the entire volcano is still commonly called Alba Patera in the planetary science literature. Many tectonic features are found near Alba Mons in the form of faults and graben. Grabens form when the crust is stretched and a section moves down. One area just to the south is called Ceraunius Fossae. A group of faults just to the east is called Tantalus Fossae. Several possible causes have been suggested for these features, but it is probable that the weight of nearby Olympus Mons is involved. Diagram showing how a graben forms from the extension of the crust. Crustal stretching causes two faults and then a center section drops. Many lava flows are visible on the mountain, especially in the form of sheet flows, lava tubes, and lava channels. Lava tubes have been suggested as a good site for future colonists, as they would offer protection from the extreme weather and radiation. 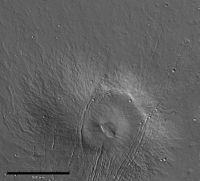 MOLA view of lava flows extending from center of Alba Mons Some of these flows are lava tubes that may be used for explorers. ↑ A Google Scholar search of the astronomy and planetary science literature from 2007 to 2011 reveals 106 uses of Alba Patera versus 5 for Alba Mons (accessed May 7, 2011). ↑ Carr, M.H. ; Greeley, R.; Blasius, K.R. ; Guest, J.E. ; Murray, J.B. 1977. Some Martian Volcanic Features as Viewed From the Viking Orbiters. J. Geophys. Res. 82 (28): 3985–4015. ↑ Pieri, D.; Schneeberger, D. 1988. Morphology of Lava Flows at Alba Patera. 19th Lunar and Planetary Science Conference, Abstract #1471.